GOP State Sen. Scott Brown and state Attorney General Martha Coakley, a Democrat, get ready to debate this week in Boston. (CNN) -- Republicans may be on the verge of pulling off what was politically unthinkable until now: winning the race to fill liberal lion Edward Kennedy's U.S. Senate seat in Massachusetts. Tuesday's special election is deadlocked, according to a new poll. President Obama will campaign Sunday in Massachusetts to try to help save the seat for Democrats, White House spokesman Robert Gibbs said. A GOP victory in overwhelmingly Democratic Massachusetts could give Senate Republicans enough votes to block Obama's health care plan. It also could shatter assumptions about the competitiveness of politics in the progressive Northeast. No Republican has a won a U.S. Senate seat in Massachusetts since 1972. The state's entire congressional delegation is Democratic. Obama crushed Sen. John McCain in Massachusetts in 2008, beating the GOP nominee by 26 percentage points. Kennedy, an advocate for overhauling health care throughout his career, held his seat for more than 46 years. His brother, President Kennedy, had it for another eight. A Suffolk University/7 News poll released Thursday night indicates that 50 percent of likely voters back GOP state Sen. Scott Brown. Forty-six percent support state Attorney General Martha Coakley, the Democratic nominee. Three percent back Joseph Kennedy, a third-party candidate who is not related to the late senator. Brown's lead of 4 percentage points is barely within the survey's sampling error. "It's a massive change in the political landscape," said David Paleologos, director of Suffolk's Political Research Center. 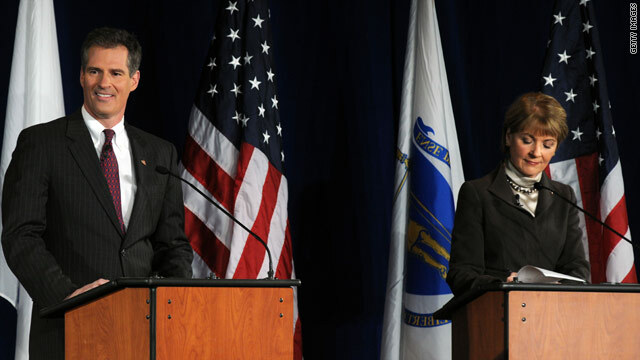 A Boston Globe poll released last weekend indicated Coakley had a 15-point lead over Brown, but other recent surveys, including several partisan polls, suggested the race was much closer. Two national political analysts, Charlie Cook and Stuart Rothenberg, rated the race a tossup Thursday. According to the Suffolk/7 News survey, Brown is grabbing 65 percent of independent voters, with three in 10 pulling for Coakley. And 17 percent of Democrats questioned said they're supporting Brown. If Brown pulls an upset and defeats Coakley, the Democrats will lose their 60-seat filibuster-proof coalition in the Senate. The shift could threaten the party's priorities on health care and a range of other issues. Brown has promised to vote against the health care bill if elected. Kennedy, 77, died of brain cancer in August. Democrat Paul Kirk, a longtime adviser and friend of Kennedy's, is serving as his interim replacement. Massachusetts Secretary of State Bill Galvin, a Democrat, said this week that certifying Tuesday's election results could take more than two weeks, potentially enough time to allow congressional Democrats to pass a final health care bill before Brown would be seated if he wins. Republicans blasted the timetable, accusing Democrats of trying to stifle the will of voters. The Suffolk/7 News poll indicates 51 percent of voters oppose the health care reform legislation, with more than six in 10 saying they believe the government can't afford to pay for it. The survey was conducted by phone Monday through Wednesday, with 500 people who said they are likely to vote in Tuesday's special election. The poll's sampling error is plus or minus 4.4 percentage points. Both campaigns have raised large sums of cash in the past week, and combined they have spent more than a $1 million on television commercials. National party organizations as well as independent groups also have flooded the airwaves in the typically politically uncompetitive Massachusetts. Two well-known out-of-state surrogates are teaming up with the candidates Friday. Former President Clinton is holding rallies in Boston and Worcester for Coakley, while former New York Mayor Rudy Giuliani teams up with Brown. On Thursday, Obama put out an e-mail and Web video in support of Coakley. The e-mail was sent to the Massachusetts distribution list of Organizing for America, the president's political arm at the Democratic National Committee. "I am supporting Martha Coakley. As your attorney general, she's taken on Wall Street schemes, insurance company abuses, and big polluters," Obama says in the e-mail. "She'll be your voice, and my ally. And she needs your help." Vicki Kennedy, the late senator's widow, also is making a pitch for Coakley in a new television campaign commercial that started airing Friday. CNN's Paul Steinhauser and Alan Silverleib contributed to this report.